We talk about amateur radio with Alan Wolke, W2AEW, in this episode of The Engineering Commons podcast. Jeff got interested in amateur radio around the age of twelve or thirteen, while leafing through his father’s Heathkit catalogs. Amateur radio allows licensed enthusiasts to use allocated radio frequencies (RF) for non-commercial communications. 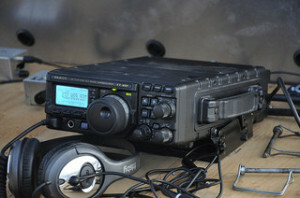 The term “ham” was originally intended as a slur, but is now commonly used in referring to an amateur radio enthusiast. Our guest is Alan Wolke, who is an applications engineer for Tektronix. Some of our listeners may remember Alan from his appearance on The Amp Hour podcast in October of 2012. The largest association of ham radio operators in the United States is the American Radio Relay League (ARRL). Phased array antennas are not commonly used by hams, but are sometimes utilized in applications requiring large signal gain. One such application is “moonbounce,” or Earth-Moon-Earth (EME) communications. It’s possible to get into amateur radio for $400 to $500, and be able to talk around the world. For local communications, a handheld radio could be had for less than $100. Broadcast frequencies have differing propagation characteristics, depending on the signal wavelength. Communication ranges at higher frequencies are often augmented through the use of repeaters that rebroadcast an incoming signal. Echolink and IRLP are systems that permit repeaters to connect to one another through the internet. Alan enjoys listening to the “Solder Smoke” podcast, which often discusses ham radio issues. “Copying code,” or translating Morse code, is a skill that is no longer required for an amateur license in the US. Alan “relearned” Morse code using a program available from G4FON. All questions that appear on license exams are freely available online. Alan’s personal website is www.dorkage.com. He also has a YouTube channel. You may find Alan’s writings from time to time on the Tektronix blog site. Look for Alan on Twitter as @AlanAtTek.